"I Will Answer Only to Allah"
An Islamist radical convicted of stabbing two German police officers during a protest against "offensive" cartoons has been sentenced to six years in prison. Murat K, a 26-year-old German-born Salafist of Turkish heritage from the western state of Hessen, openly admitted that he had attacked and wounded the two police officers with a kitchen knife during the cartoon riots in May. He showed no remorse, however, during his trial at the district court in the city of Bonn; he said he had been morally obligated to follow Islamic Sharia law. Murat, whose last name has not been made known to the general public due to German privacy laws, claimed that the attacks on the police officers were justified because the German state had allowed offensive images of the Prophet Mohammed to be shown in public. Many Muslims believe that according to Islamic law, it is forbidden to depict Mohammed in images. During his trial, the judge -- who allowed Murat to wear a black jihadist headband in court -- asked the defendant whether it was necessary "to use violence to defend Islamic values." Murat, who was born in the German town of Eschwege, and whose family has been living in Germany for decades, replied: "Yes, of course." The judge then asked him to "imagine you are a policeman and it is your job to ensure order. In your view, would you be a justified target?" Murat replied: "Yes. The German state allows caricatures of Mohammed to be shown, so the police are automatically involved." The judge continued: "What if a court said it was all right for the caricatures to be shown?" Murat replied: "Your values make it possible to insult the prophet. Islam prohibits that. The price for doing that in Islam is the death sentence. You have your freedom of opinion, but as a Muslim, a believer, Islam must be my opinion." Murat added: "One cannot expect from a Muslim that he remain calm when the prophet is being insulted." On October 19, the district court in Bonn found Murat -- who is unemployed and lives on state welfare benefits -- guilty on charges of causing grievous bodily harm, disturbing the peace, and resisting a law enforcement officer. The court sentenced him to six years in prison, in line with demands by state prosecutors, who had asked the court to sentence Murat to at least five years and nine months. The Interior Minister of the German state of North Rhine-Westphalia, Ralf Jäger, applauded the conviction. "The verdict is a clear signal that in our constitutional state, brutal attacks against our police officers will be consistently punished." Murat's defense attorney, Johannes Pausch, said he had asked his client if he would at least be willing to apologize to the policemen, not as state employees but as human beings. Murat refused. "It was not possible for him to show remorse," Pausch said; "he believes he is right." Murat responded to the verdict by declaring German courts to be illegitimate. He said: "I do not accept this court as legitimate. I am not sitting here voluntarily. Only Allah alone has the right to decide what is right and what is wrong, what is good and what is evil, what is moral and what is immoral." Murat added: "I will answer only to Allah." The stabbings occurred on May 5, when more than 500 radical Muslims attacked German police with bottles, clubs, stones and other weapons in Bonn, the former capital of West Germany, to protest cartoons they said were "offensive." The clashes erupted when around 30 supporters of a conservative political party, PRO NRW, which is opposed to the further spread of Islam in Germany, participated in a campaign rally ahead of regional elections in North Rhine-Westphalia (NRW). 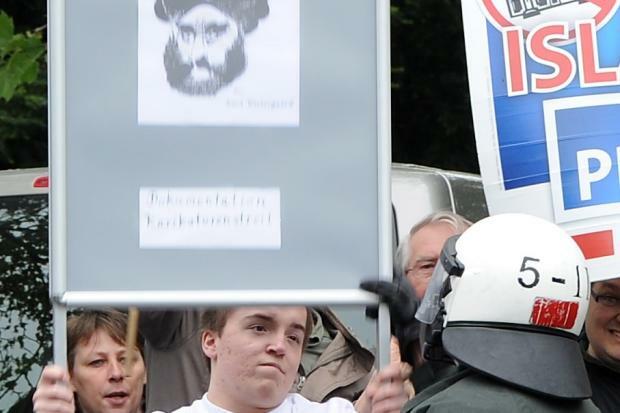 Some of those participating in the rally, which was held near the Saudi-run King Fahd Academy in the Mehlem district of Bonn, had been waving banners depicting Mohammed (see photo here), to protest the Islamization of Germany. The rally swiftly disintegrated into violence (photos here and here) when hundreds of angry Salafists, who are opposed to any depiction of their prophet, began attacking the police, whose job it was to keep the two groups apart. In the final tally of the melee, 29 police officers were injured and more than 100 Salafists were arrested, although most were later released. Murat is the first Salafist to be tried for the violence; 22 other Salafists are still waiting for their trials to begin. According to German Interior Minister Hans-Peter Friedrich, "Salafism is currently the most dynamic Islamist movement in Germany as well as internationally. Its fanatic followers represent a particular danger for Germany's security. The Salafists provide the ideological foundation for those who then turn violent." Friedrich has been leading a multifaceted nationwide crackdown on Salafism and other radical Muslim groups in Germany (see here, here, here and here). The Secretary General of the ruling Christian Democratic Party (CDU), Hermann Gröhe, in an October 19 interview with the German newsmagazine FOCUS, said the conviction of Murat makes it clear that Germany will not allow radical Muslims to "lead a religious war on German streets." Gröhe was also asked if he could "understand that many people in Germany have concern for the Christian character of the culture, not least because of the growing number of Muslims in the country?" Gröhe responded: "The Christian character of our country is not at risk just because a religious minority goes to the mosque, the synagogue or to another place of worship. A far more important factor is when a significant number of church members only remember their Christian roots on Christmas Eve. I am less concerned about full mosques than I am about far too many empty churches."